Originally released for the Apple Macintosh way back in 1990, but today available for both Microsoft Windows and the Apple Macintosh. Adobe Photoshop is today the industry-leading bitmap and photo-editing software package. Photoshop includes functions for working with both bitmaps and vectors, and includes support for a variety of color models including RGB, CMYK, gray scale, and duotone. The software is centered around a concept of layers which can used to blend or composite multiple images together, as well as allow you to easily undo any mistakes that you make during editing. 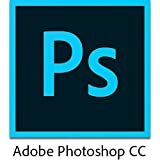 Aside from the power built-in to the program itself, an additional reason to use Adobe Photoshop is the number and range of additional products available. This includes products developed by Adobe and products created by third parties, and include books, tutorials, and compatible third party software. The main downside to using Adobe Photoshop is the price. There are however discounted versions available from time-to-time such as a education versions (only available to bona-fide educational users). Additionally, Adobe also offer a less expensive version of the program with reduced functionality: Adobe Photoshop Elements. More freedom, speed, and power to make incredible images real with the new Adobe Photoshop CC. You get dozens of new and reinvented features, including the most advanced sharpening tool available. Plus, cloud-enabled Sync Settings and Save to Cloud let you create with everything you’ve got wherever you are. You can also publish your work to Behance, the world’s largest creative community, directly from the new Photoshop CC.